It saddens me to think that art lovers had to pay for their enthusiasm by being shot at with “22 injured, I dead” at the Art All Night Festival. Today, Majority of the practicing artists are resigned to the fact that staying relevant is a challenge they need to cope with while expecting absolutely nothing by way of financial remuneration from the practice itself. With this shoot out, it would appear as though their lives could be at stake, given that most of the art events are held in order to activate the depressed parts of the state. Even though I have always practiced some form of art all my life it wasn’t until much later that I embarked on a carrier path in the arts. Hence, I retained some unfounded beliefs about artists being free spirited, friendly and embracing. 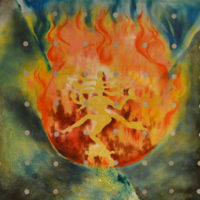 Starting out in New Jersey my first break came from Robyn Tremor the director at the Contemporary Art Center in Bedminster where I had my first solo show on Symbolism in Indian Mythology. 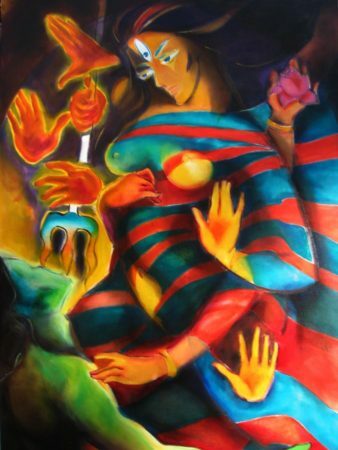 I remembered being shocked to learn a few days before the show commenced, that someone had punctured with a knife, one of my large oil paintings titled, “The Dilemma of Durga”. The Center was just as shocked and had the piece restored. I continued with my pursuit of the arts starting with the home state of NJ making absolutely no headway until my very first success at the Torpedo Art Factory, 2011 in the state of Virginia. At the opening reception, the appreciation and attention that my work got was quite overwhelming! 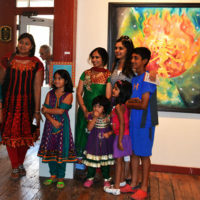 Equally overwhelming was the level of work done by the rest of the participating artists. For the first time I wondered why I never had success in my home state prior to this?! Would it be relevant to mention that Robyn Tremor at Contemporary Art Center was originally from Brooklyn and not NJ? Eventually I had my work exhibit in museums and galleries in many states and countries. Boosted by relative success in other places, I tried once again in my home state of NJ. This time I made it at a juried exhibit at New Jersey Artists Guild in Rahway and the Newark Museum. In my enthusiasm to get to know the rest of the exhibiting artists at the AGNJ, I remember forgetting to take a photo of my own work in the gallery. I took pictures of all the participating artists and found it fascinating to hear about their practice. Despite the fact that much of the conversation was initiated by me, I was optimistic about finding my own tribe close to home! Back to the shootout in Trenton at the art festival, as unfortunate as it is, makes me revisit the karma of the organizers of the festival. It was there that I first encountered extreme racism when I was given a part of their gallery space to organize a show for SIPMA Contemporary. Long story short, an old friend now a partner at a law firm in Manhattan intervened when the gallery would not respect the contract that was signed and threatened not to release works of participating artists in their intent to hurt the reputation of the organizers at SIPMA Contemporary. And that’s not where it ends. The year after in 2017, when we organized a show at the Printmaking Center of New Jersey, the Trenton Gallery got their artists to gang up and make spurious phone calls to NJPC spreading false and harmful rumor about SIPMA, and all because I was their primary contact, and my face was brown. The deep divide among the people of NJ and other parts of the country, makes artists suffer and defeats the purpose of art itself. My hope is that if there is a single purpose to this financially decrepit pursuit, that is art, it will be that of inclusion. There has been much uproar of late about the exclusion of some of L.N. 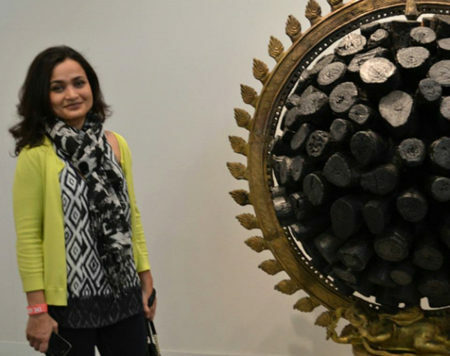 Tallur’s works from ‘India and the World: A History in Nine Stories’ an exhibition currently going on at the National Museum. Much to the outrage of the arts community, the censorship by the Director General of the National Museum appeared to be on grounds that the depiction of Natraaj was in some way trivialized. Quite possibly before 2014, when he first exhibited at Jack Shainmann in Chelsea, a short walk away from my work at the time. Since I had obligations to fulfill that evening I stepped out at lunch to take a peek at the exhibit which was due to open that evening. Having learnt that there were more of his works being shown at the other location of the gallery a few blocks down, I set out to see if I could make it to the new location before having to head back to work, just when I stumbled into an apparently sleep deprived Tallur who invited me to his opening in a soft spoken polite tone. Even though I was unable to attend that evening, the works I saw stayed with me and upon encountering them once again at the 2014 armory, I had to do a selfie with it, well not quite, as I hadn’t as yet mastered the skill of taking effective selfies, had to ask someone else. 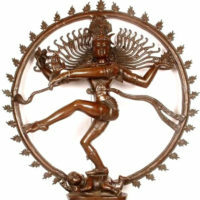 The image of Natraaj or Shiva engaged in the cosmic dance inside a ring of fire atop a dwarf who represents ignorance and epilepsy. The image is that of tolerance above all else as it has a place for ignorance in the midst of the ultimate quest for creation and liberation. As ubiquitous as the original image might be, it has always been open to interpretation as all symbology is. 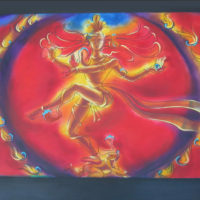 My own take, Algorhythm and Cosmic Dance, veered from the original to a degree. Instead of adding my own rant to the disappointment on Mr. Mukherjee’s decision on the matter, let me share Fritjof Capra’s observation on the outcome of organized expression of spirituality. The exhibit being the “organized expression” in this case and our stumbling block clearly is the inability to process a symbol for what it is rather than judging it with bias of conditioning.